BlockFollow markets itself as a social service that can enhance the cryptocurrency community. With BlockFollow, users can connect with others using the blockchain, track transactions, earn money and share their knowledge. BlockFollow lets users interact with each other to enhance their cryptocurrency trading experience. The idea is that by contacting others who have experience and different perspectives in the world of cryptocurrency, you are more likely to have success in terms of trading. The sense of community in BlockFollow is furthered by the ability to teach others and learn from other members. You can use the platform to do both. You can learn more about cryptocurrency trading and related topics, including in courses. Those with the extra knowledge can share it and earn rewards for doing so, whether they write an informative article that others can read or a course that members can take. The exchange on BlockFollow is of an advanced nature: You can set up your targets using the platform’s charts and allow the system to take care of everything. 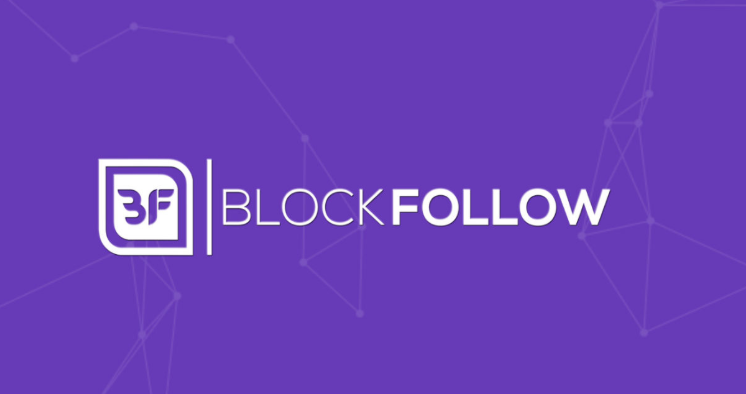 BlockFollow aims to deliver a reliable and seamless trading experience that involves promising projects as well as trading pairs selected by the community. How Else Does BlockFollow Make it Easier to Manage Your Crypto Trades? The team behind BlockFollow recognizes that the cryptocurrency world is incredibly volatile, which leads to excitement as well as the opportunity for significant profit. However, to make that profit, you must see the bigger picture. BlockFollow makes it possible to see your transactions over time to view this larger picture and trade intelligently. You can even handle several portfolios with real-time information. Can You Make Transactions with BlockFollow? As a community platform with a focus on cryptocurrency trading, BlockFollow allows for instant transactions between members that are completely costless. Your BlockFollow profile can connect to your payments with ease. There are also merchant tools on the platform that let you build a business and receive payments via the platform. How Do Users Earn Money with BlockFollow? In addition to the other elements that can enhance your trading success, it is also possible to directly earn money with BlockFollow. The platform rewards users who share their information that can help others. Just some of the information that can receive a reward includes validating a rumor, making a complete trading course, or doing a full report on a particular coin. In this way, you can essentially earn money by socializing and sharing your knowledge. Using BlockFollow, you can build up a brand that is recognized. Your online presence will complement your experience and let you market your skills to the community, giving you another source of revenue. What Other Tools Does BlockFollow Offer? The BlockFollow platform also includes a calendar that has up-to-date news as well as events that may be relevant. This makes it easy to weed out rumors and focus on actual facts and events. Thanks to community power and incentives for information sharing, BlockFollow can deliver accurate and quick reports so you stay up to date. The team at BlockFollow understands that you cannot always be at your computer. Yet with the cryptocurrency world’s fast-changing nature, you always need to stay up to date on information. That is why it offers a mobile version as well as the website, so you can access BlockFollow on the go. BFN is the BlockFollow Network token that will be used on the platform. This token is an ERC-20 token during the ICO, but later on, BlockFollow will begin its own blockchain. Once this is complete, the investors can upgrade their tokens to the new versions on BlockFollow’s blockchain. There is a total maximum supply of BFN of 210 million. Twenty million BFN are allocated for the pre-ICO, with 100 million allocated for the ICO. 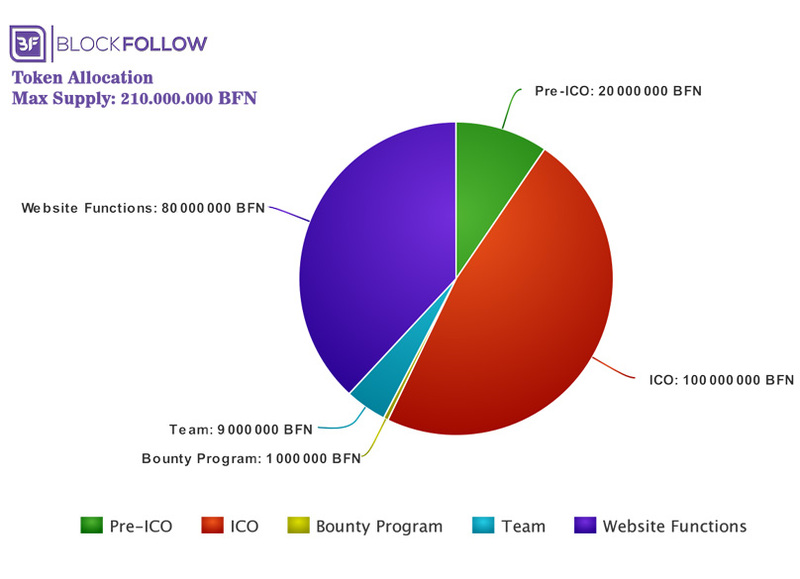 Eighty million BFN are set aside for website functions, with another 1 million for the bounty program and 9 million for the team. BlockFollow is currently in the pre-ICO, which lasts from July 9–23. the ICO will then run from July 30–Aug. 27. Contributions must be in Ethereum. During the pre-ICO, 1 BFN is equal to 0.00012 ETH, so each ETH spent gives you 8,333 BFN. If there are unsold tokens following the pre-ICO, they will be moved to the ICO. During the ICO, each BFN costs 0.00018 ETH, so 1 ETH contributed will give you 5555 BFN. The minimum contribution amount is 0.05 ETH. If there are unsold tokens following the ICO, 75 percent of them will be burned. The remaining 25 percent will be distributed among the investors from both the pre-ICO and ICO. Those looking to make larger investments did have the option to negotiate a private sale prior to the pre-ICO. These private sales came with a minimum investment amount and included a 60-day lockup period following the ICO to prevent investors from buying tokens at a discount just to sell them at market value, as this drops the overall token value. In addition to the pre-ICO and ICO, BlockFollow has an airdrop. This is free to participate in and involves receiving BFN tokens in exchange for simple tasks. You can take part in the airdrop by joining the Telegram group, following BlockFollow on Twitter, and liking its Facebook page. You can then get bonus tokens by subscribing via the website. To participate in the airdrop, just complete the relevant form and the tasks. You then receive 100 BFN, which is an estimated value of $12.50. You will also get a referral code, and if someone signs up using it, you get an additional 50 BFN. Airdrop tokens will be distributed following the ICO. BlockFollow is a platform that lets cryptocurrency traders and anyone interested in crypto interact with each other. 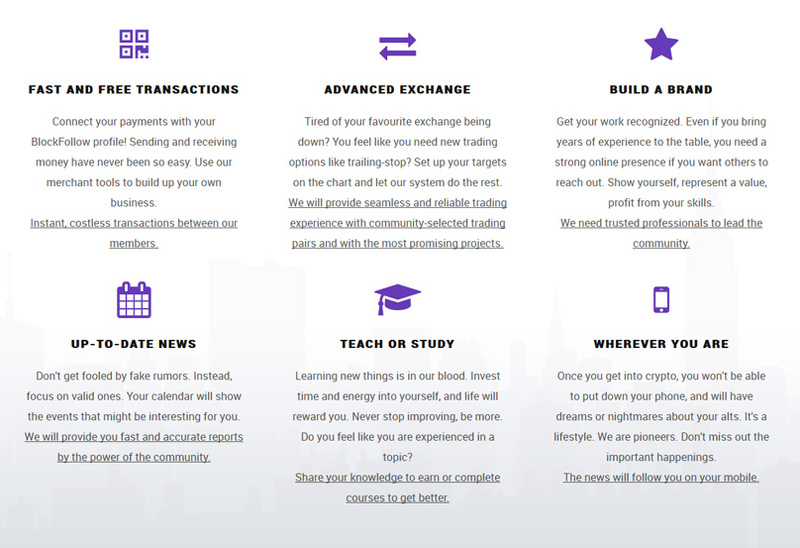 There are some features to help with trading, the ability to share your knowledge and learn from others, and the ability to send transactions to other members for free. The pre-ICO and ICO are currently in progress, and BlockFollow plans to have the alpha version of the website by mid-November.